I thought that this time of the year would be perfect to talk about the sunscreen products that made it to my list of repurchases. That’s a narrow list because I have had a problematic relationship with face sunscreen for years. I can’t stand the feeling of a tacky, greasy, pasty-looking layer of bizarre-smelling lotion on my face. I am also a recovering sun worshiper. I spent most of my life enjoying the sun carelessly. It’s finally Spring–at least in this side of the globe—though it hasn’t been feeling that way in some places (even here in Florida evenings have been more chilly than usual). I know that some of you will go on vacation, head to festivals, or just spend more time outdoors. So I wanted to give you not only my product recommendations, but also share with you what I look for in sunscreen products. I want to share which key facts I keep in mind, which labeling claims are important/totally worthless, and which ingredients I want/avoid and why. 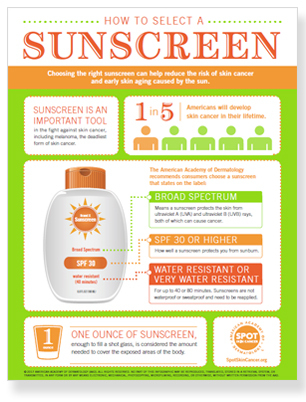 Before talking about products, I want to touch on some important basic info about sun protection. This is a topic that is very dear to my heart because, 1) I lost my dear uncle to melanoma, a skin cancer, and 2) I have experienced a lot of sun damage on my face due to my irresponsible exposure to the sun in my teens and twenties (sunspots, discoloration, textural changes, etc). All things that I cannot reverse completely, and cannot improve significantly without expensive treatments. I hope that this information is going to help you to prevent making the same mistake, or at least prevent further damage. It’s never too late to start taking good care of your skin. Also keep in mind that it is estimated that sun damage accounts for 80% of skin’s premature aging, including wrinkles, sagging and sunspots. No matter how well you take care of your skin with diet, lotions, and potions, if you don’t protect it from the sun, you are doing your skin (and your wallet) great disservice. Sun Rays: Are They Really Harmful? There are three main types of UV rays (in which UV stands for ultraviolet radiation): UVA, UVB, and UVC. We don’t need to worry about UVCs because they don’t reach the earth and do not cause any damage to the skin, but we need to protect our skin from both UVAs and UVBs. Both types of rays can cause cellular damage and oxidative stress. UVAs are the ones that reach our skin all year long–no matter the weather–because they can penetrate clouds. These are the rays that cause damage to the deepest layers of our skin (called dermis) and cause photoaging. They destroy collagen and elastin, leading to wrinkling and sagging. UVBs are the rays that cause damage in the most superficial layer of our skin. They cause the reddening of our skin–the sun-tan/sun-burnt look. “Tan” is basically a nice way to describe a sunburn. 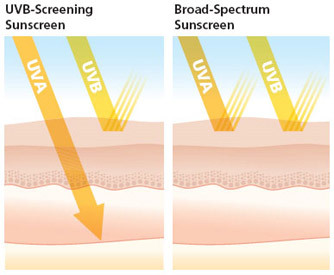 UVBs are thought to be responsible for skin cancers. According to the Skin Cancer Foundation and the American Academy of Dermatology, using sunscreen can reduce the risk of non-melanoma cancers by 40 percent and melanoma by 50 percent. In light of the type of damage that these rays can cause, the first thing that I look for in a sunscreen is broad-spectrum protection. When a sunscreen is labeled as broad-spectrum, it means that it has passed an FDA-regulated test that proves that the product protects the skin from both UVAs and UVBs. Keep in mind that the active ingredients that are known to filter UVAs are avobenzone (in chemical sunscreens), zinc oxide (in physical sunscreens) and titanium dioxide (in physical sunscreens), which is considered slightly less effective than zinc oxide. There are three main categories of sunscreen products that can protect the skin from UV damage—chemical sunscreens, physical sunscreens, and a combination of the two. Chemical and physical sunscreens work in different ways, so it’s important to understand the difference in order to make the best choice for your skin. Chemical sunscreens contain carbon-based compounds that absorb the UV rays when they reach the skin, change them into heat, and then release them. They are also called “organic” sunscreens due to the active ingredients being carbon-based, (keep that in mind, because if you search for “organic” sunscreens, your search will lead to chemical sunscreens). They have the benefit of being virtually weightless in texture and cosmetically pleasing—easy to spread, blend, and clear. Unfortunately, the active ingredients in chemical sunscreens tend to be very irritating and potentially (likely) sensitizing. This means that your skin can become more sensitive to a certain chemical filter as you keep using it, until it starts triggering a reaction. For my skin, the ones I tried have been a total nightmare, causing a lot of redness and stinging. The fact that they cause the skin to heat up (because they absorb the UV rays and “transform” them into heat) can also cause problems for people who suffer from inflammatory skin conditions like rosacea and acne. Chemical filters also present the problem of breaking down in the sun, because the active ingredients are typically unstable. In addition to that, some of the active ingredients in chemical sunscreens have presented some safety concerns. Some of these compounds are thought to cause harmful effects on the body, such as disrupting hormones. 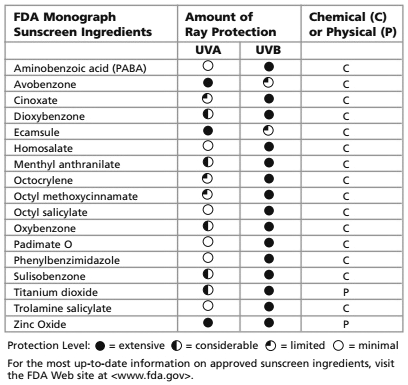 Therefore, if you currently use a sunscreen product that contains oxybenzone, octocrylene, octinoxate, homosalate, or octyl methoxycinnamate, I would highly encourage you to consider an alternative, as these seem to be the most concerning ingredients. Lastly, if you have sun spots, keep in mind that the heat caused by chemical sunscreens in your skin may worsen/increase brown spots. Chemical sunscreens are the ones that you need to apply 20 minutes prior to sun exposure and re-apply frequently. They tend to degrade with time, so make sure to check the PAO (period after opening) date and the expiration date. Physical sunscreens are also called mineral sunscreens or sunblock. The reason behind their name is that the mineral active ingredients deflect the UV rays, forming a physical barrier that does not allow the UV rays to penetrate into the skin, which is why they are also called sunblock. The active ingredients used in these type of sunscreens are usually zinc oxide, titanium dioxide, or a combination of the two. 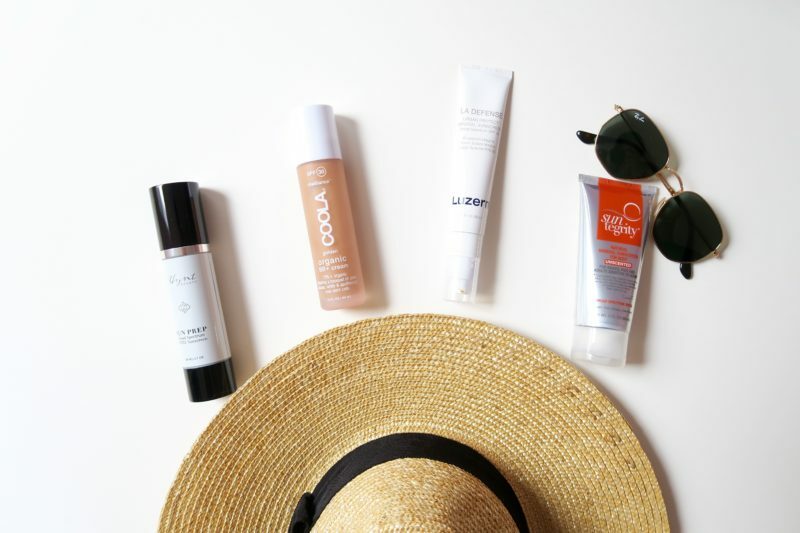 While I often use products that contain titanium dioxide, my number 1 choice for sun protection are products that contain zinc oxide as their only active ingredients, preferably in a concentration of 18-20%. The biggest problem with physical sunscreen and the reason why so many people choose chemical instead is that physical sunscreens tend to have a chalky, paste-like texture and leave an aesthetically unpleasing white cast on the skin. This is especially problematic for people with deeper skin tones. Some companies try to make the texture more comfortable and easy to apply by adding ingredients like dimethicone, which helps the minerals not to clump together over time. Although I am not fond of silicones in skincare, I am okay with using them in sunscreens, due to the consistency issues. Other brands offer tinted mineral sunscreens, where the tint is meant to disguise the whitening effect. SPF Rating: How Much SPF Is Really Enough? SPF(sun protection factor), measures the sunscreen’s ability to prevent sun damage from UVB rays. This is a slightly difficult topic because, as the scientific research advances and new things are learned about how UV rays affect the skin, regulations are revised and new active ingredients are proposed. It’s good to stay up to date with what is recommended. Sunscreens with SPF above 50 do not offer significantly more protection than SPF 50 (about 98.5 %), so don’t let marketing tricks get you. Here is another way to explain SPF ratings: if it takes 10 minutes for your skin to burn in the sun, with an SPF 15 sunscreen it will take 15 times longer for your skin to burn (so 10 times 15 = 150 minutes) and with an SPF 30 sunscreen it will take 30 times longer, etc. That being said, no matter what the SPF rating of a sunscreen is, it should be re-applied throughout the day, as often as indicated on the product label, which is typically every two hours. According to research, most people need approximately a nickel-sized amount of sunscreen for face and neck. Sunscreen should be replaced as often as every year as they degrade and lose effectiveness. Always check your sunscreen’s label and set a reminder for yourself. I apply a sticky label with a date when I open a new sunscreen so I know when it’s time to toss it away (I would most definitely forget otherwise…). The reason why most mineral sunscreens leave a ghostly white cast on the skin is the size of the particles. In recent years, cosmetic chemists have begun to experiment with much, much smaller mineral particles that make the final product go on smoother and look less chalky. These really tiny particles are called nanoparticles. The good news is that the smaller the mineral particles, the higher the SPF. The bad news is that the smaller the particles, the worst the UVA protection. Nanoparticles are so small that are thought to be potentially harmful when in personal care products. The fear is that they could penetrate the skin and enter the bloodstream. Although not much research has been done, the evidence available shows that nano-sized zinc oxide does not penetrate the skin and does not pose a risk to humans’ health. The ugly news is that nearly all sunscreens contain nano-sized mineral particles, including products that are labeled as “non-nano”. This is–apparently–not a problem with topical sunscreen because as I mentioned, the evidence available suggests that there isn’t much to worry about with topical application. However, there is a significant concern for powder sunscreens and spray sunscreens because when nanoparticles are inhaled, they can damage respiratory organs such as lungs. You can read more about nanoparticles in sunscreens here. Lastly, I highly recommend looking for mineral sunscreen products that containing beneficial ingredients–especially antioxidant-rich ingredients. According to research, antioxidants complement the effects of sunscreen in combating the formation of UVA-induced free radicals. In particular, look for vitamin C, vitamin E, and green tea. This is my personal advice to people with “sensitive” skin. If your skin gets irritated easily, make sure that your sunscreen is fragrance-free. 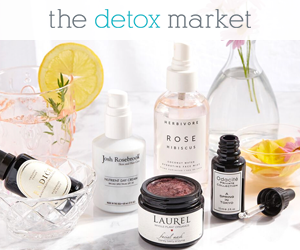 Fragrances are typically irritating and sensitizing, and when exposed to the sun they can be even harsher and increase your skin’s vulnerability to sun damage. For years, I have been looking for a face sunscreen that would not make feel the urge to scratch my face the moment I put it on. Finally, I have found a few products that I feel comfortable using and have helped me to wear face sunscreen all-year-long. These are the best mineral sunscreens that I have tried, and the only ones I have repurchased and can wholeheartedly recommend. Scroll to the end for body sunscreen recommendations as well. contains beneficial ingredients, such as: Niacinamide (which can help to reduce pigmentation), Squalane (my favorite face oil–emollient, non-irritating, UV protectant), Astaxanthin (most powerful antioxidant–more than Vitamin C! ), and more. Seriously, so many beneficial botanical ingredients for a sunscreen! My experience: this is, hands down, the most comfortable mineral face sunscreen I have ever tried. It does not feel greasy, itchy, oily, or clumpy. It’s so lightweight that it feels like I am not wearing sunscreen. This is the sunscreen I recommend to anyone living in a humid climate whose skin is more on the oily side. It is an answer to our prayers for sure. The packaging is a little bit tricky, so if you dispense it carelessly it can spritz too far and make messes. However, I find that if I direct the dispenser towards the closed palm of my hand, it doesn’t cause any issues. Lastly, take your time applying it! It may feel like it’s not settling on the skin at first, but once it does, it is SO comfortable and makes it worth it. beneficial ingredients like aloe, squalane, green tea, comfrey root, licorice root, and more! My experience: do not let the white color of this sunscreen trick you–this is the sunscreen for people who hate sunscreen. It goes on clear and does not leave any greasy film on the skin. It’s perfect under makeup as a primer & sunscreen in 1. My experience: I have been using this sunscreen as my daily moisturizer+sunscreen+foundation in 1. It has a light-to-medium coverage (it disguises redness around my nose surprisingly well), and a luminous, but non-dewy, velvety finish. 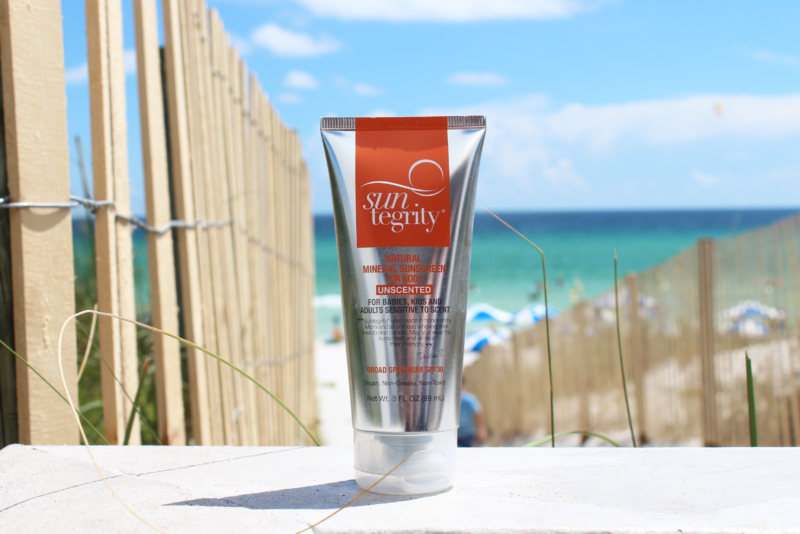 It’s my favorite face sunscreen by Suntegrity, and I would recommend to anyone who wanted to love the 5 in 1 but found it to be too heavy/oily. I use the shade Sand (compares to the 5 in 1 Tinted Sunscreen in the shade Golden Light). My experience: This sunscreen stick is my favorite for any outdoor activity like a beach day, jogging, gardening, etc. but I have also worn it for running errands. It’s the only face sunscreen I have tried that does not have any pink tone to it (most sunscreens, even those that are labeled as suitable for medium golden skin tones, tend to look pink on me). If you have fair skin, this will look too dark/orange on you. If you follow me on Instagram, check out my highlighted stories to see what it looks like on me. combo Titanium Dioxide 3.2% + Zinc Oxide 1.8%. My experience: This is one of my all-time favorite face sunscreens to wear under makeup. Best for Summer when I am a bit more oily since it has a matte finish. One of the best mineral sunscreens I have tried. My experience: In my humble opinion, this is a phenomenal skincare product and face sunscreen at the same time. You can’t just call it a face sunscreen because it contains more beneficial ingredients than your average face serum. This is the reason why, even though it is significantly more expensive than every face sunscreen I have tried, I can’t say it’s overpriced. I often apply it to bare skin as my only skincare product after cleansing and applying a toner. During hot/humid days, I find that it provides enough moisture for my skin. Work well under makeup as well. The only occasion that I would not recommend it for is for gym/exercise because I find that it melts off the skin quickly during a high intensity sweat sesh. My experience: I love this sunscreen under makeup, as a daily base. Please note that this is delicately fragranced, so if you are very sensitive, it may not be for you. I can wear it with no issues. Next, I want to try the Luzern La Defense Urban Protect BB Creme SPF20. you can buy it at Whole Foods! My experience: At $28.99 this BB Cream is a phenomenal multi-tasking product…as long as you find a good match. I am somewhere between shades Light and Medium, but none of them is an exact match. My experience: this has been my go-to body sunscreen for a few years. It offers solid protection and has kept me burn-free on long, sunny beach days.